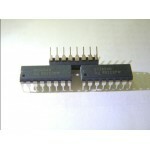 Buy online UC3710 High Current FET Driver in India at low price from DNA Technology, Nashik. The UC3710 family of FET drivers is made with a high-speed Schottky process to interface between low-level control functions and very high-power switching devices-particularly power MOSFET’s. These devices accept low-current digital inputs to activate a high-current, totem pole output which can source or sink a minimum of 6A. Supply voltages for both VIN and VC can independently range from 4.7V to 18V. UC3710 FET Driver also feature under-voltage lockout with hysteresis. The UC1710 is packaged in an 8-pin hermetically sealed dual in-line package for 55°C to +125°C operation. The UC2710 and UC3710 are specified for a temperature range of –40°C to +85°C and 0°C to +70°C respectively and are available in either an 8-pin plastic dual in-line or a 5-pin, TO-220 package. Surface mount devices are also available. UC3854 High Power Factor PreregulatorThe UC3854 provides active power factor correction for power sy..